Dr. Thomas is a board-certified comprehensive ophthalmologist with experience in treating a broad range of eye conditions such as dry eye, cataract, retinal diseases, and glaucoma. He was trained at the prestigious University of Colorado and has been practicing ophthalmology in South Texas since 2007. He has a caring approach to his patients, who appreciate his friendly demeanor, competent care, and clear explanations of their medical conditions. 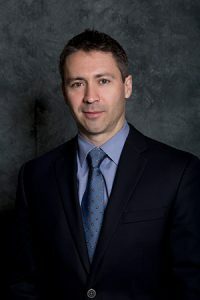 He has been named by Texas Super Doctors® to their list of top ophthalmologists in San Antonio every year from 2015 to 2018. This honor was preceded by selections to the Texas list of Super Doctors ® Rising Stars™ for three consecutive years (2012, 2013 and 2014), an honor that comprises less than 3% of ophthalmologists in the state. Since arriving in San Antonio, Dr. Thomas and his wife have grown deep roots in the community, enjoying church and outdoor activities. They stay busy raising and homeschooling their ten children. Dr. Thomas is excited to continue his practice at the San Antonio Eye Center. He is accepting new patients and looks forward to meeting you and your family.